I’ll never buy hot fudge in a jar again. Making your own from scratch is ridiculously simple to make and less expensive than a gourmet jar of hot fudge. Since this is actually a recipe for chocolate ganache, you will be able to use it for all kinds of things. You can refrigerate it, scoop it out, and roll it in cocoa powder to make truffles. You can pour it over a cake for a flawlessly glossy icing. You can refrigerate it in a cake pan and slice it for the most sinful chocolate cake you’ve ever had—Endless possibilities! 1. In a microwave safe bowl, heat cream to almost boiling, about 60 seconds. Pour in chocolate chips and vanilla. Allow to rest for 35 seconds, or long enough for the chips to start melting. 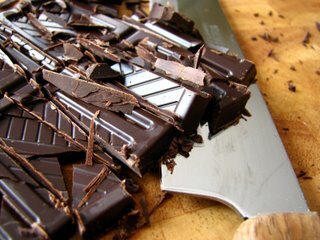 Whisk until chocolate is smooth and glossy. 2. Serve over ice cream immediately, or refrigerate for later. To reheat, microwave on high for 20 seconds at time, stirring after each interval until ganache is smooth wand shiny again. via Hot Fudge Sauce in 99 seconds. 3. Break the chocolate into small pieces and melt it with butter over hot water. 4. Beat the eggs with sugar, mix with flour, cocoa powder, baking powder and vanilla extract. 5. Slowly fold in the melted butter and chocolate and the sour cream. 6. Bake at 350 degrees until a wooden pick inserted in center comes out clean, approximately 40 to 50 minutes (if using 2 cake tins 20-30 minutes may be sufficient). 7. Cool the cake completely. When it has obtained room temperature place it in the refrigerator for at least 30 minutes before removing the cake from the tin (the cake is sticky and difficult to cut when it is warm!) Remove the crusted surface on the top of the cake, and cut in half, horizontally. 1. Heat 2/3 cup (1.6 dl) of heavy cream or whipping cream in a sauce pan. 2. Remove from heat, add 9 oz (260 g) of finely chopped dark semisweet chocolate, stir until smooth, and let it cool until in thickens. 3. Use one 1/3 of the frosting between the two layers, 1/3 on top, and the rest around the cake. Put the cake into the fridge for one hour or more to harden the frosting. 4. This cake should have room temperature when served. 1. You may add 3 tablespoons of rum to the chocolate and butter mixture. 2. 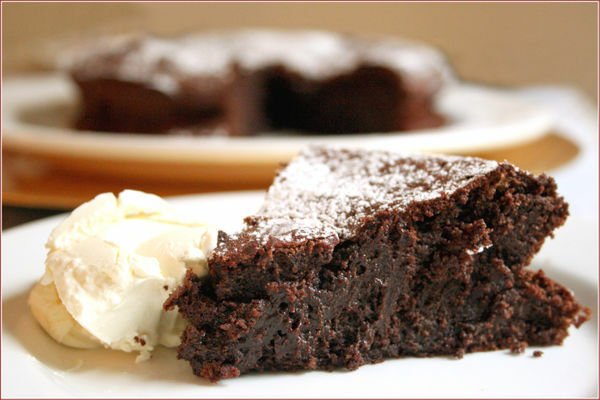 You may use your preferred chocolate frosting, or the frostings described for Chocolate Tart or Devil’s Food Cake. 3. You can add chopped walnuts and decorate with whole walnuts for a marvelous nutty treat! via Death by chocolate – Recipe.